momstown Winnipeg: Celebrate Chinese New Years with the Kids! I am a firm believer of teaching your children your heritage and to also explore other cultures. Canada is such a diverse country and we should celebrate this. 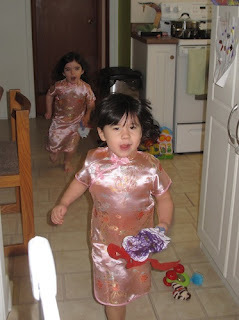 My children are a quarter Chinese from my husbands’ side so I wanted to teach them all about Chinese New Years. Unfortunately their Great Grandma Chin past away last year and my Mother-In-Law was out of town. How was I to teach them this important Chinese celebration without the help of the pros?!?! In comes Google. I searched, and searched, and searched for some history, facts, ideas, and the superstitions. If you know anything about the Chinese culture, it is that they have superstitions and ‘what not to do’ lists! I didn’t want to screw this up! I even went to a Chinese market all alone! I was nervous. I’m not really sure why. Maybe they’d wonder what I’m doing in there. Do I bring my child in with me so they clearly get the Chinese connection! If you see my daughter the eyes are a dead giveaway. So I immediately found the lai see, red envelopes used to give money. I also purchased some oranges and fortune cookies. When I went to pay they lady smiled at me and said ‘Happy Chinese New Years’. She totally knew why I was in there! I found some great craft ideas and downloaded Chinese music from itunes. What’s a party without dancing? My Latin background is in my blood. You can’t take the love of dancing out of me. Instead of the usually salsa I do with my daughter I was planning a dragon dance. After all, it’s the year of the dragon! I also got some ornaments from my Mother-In-Law’s and used the ornaments for decorations. And I informed our guests to wear red. Believe it or not, I couldn’t find red for my daughter. But she has a few beautiful Chinese dresses, so I put one on her. I broke a rule!!! She wore pink! All well. Next year I’ll be more prepared. So the day of the party came. Some momstown mama’s came over with their kids. We had circle time and talked about Chinese New Years. Here are some facts I gathered, courtesy of mindful mum and A China Family Adventure. Chinese New Year is the most significant holiday in the Chinese calendar, where it is known as the ‘spring festival’. People celebrate the beginning of the new season as it symbolizes new life and marks an end to winter. Celebrations start in the first day of the lunar cycle, and end on the fifteenth day, when the moon is at its brightest. For 2012 it starts on January 23. Before celebrations for New Year begin, however, it is considered prosperous to completely clean one’s house; this symbolizes sweeping away any bad luck that the previous year may have brought. After the house has been cleaned, brushes, dustpans and brooms are all put away, as cleaning at any time after this might sweep away the good luck that comes with the new year. It is traditional for families to hang red lanterns outside their houses and to wear new red clothing, as it is believed that doing so will ward off any evil spirits. Fireworks are also set off for this reason. On New Year’s Eve, families will reunite and enjoy a large traditional meal together. After our circle time we did crafts. 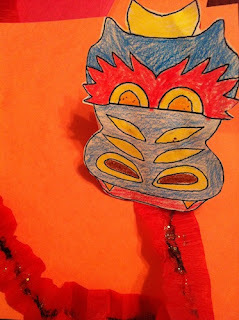 The kids made red lanterns and dragons. Click here to see how to make a lantern. For the dragon, I found a great dragon craft on Kaboose. 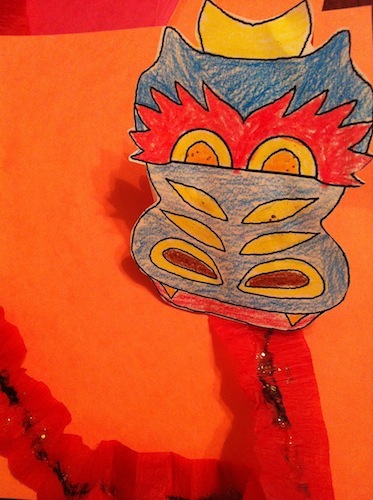 Print out a dragon head, have the kids decorate it and add a piece of streamer for the body. The kids used this during their dragon dance. For a snack we ate oranges and fortune cookies. Then we used our dragon craft and danced to some Chinese music. The kids had a blast! 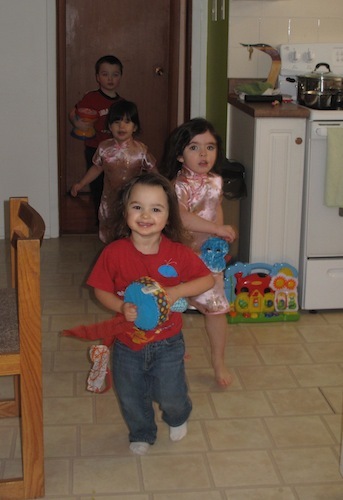 They danced in a circle and also danced around the entire house chasing one another with their dragons. After a half an hour of dancing it was time for home time. My daughter helped me hand out the lai see and we practiced saying Gung Hey Fat Choy as our guest left. I’m sure I didn’t quite follow the entire traditions of Chinese New Years but I think Great-Granny Chin would be proud that we celebrated and honored this very important holiday!